A total of 14 million cars were carried by ferry operators in the UK and Ireland last month. The number of holidaymakers taking their cars on UK and Irish ferries has risen by 4% in July compared with the same month last year, new figures show. Industry body Discover Ferries says good weather and more people choosing to "avoid the hassle of airports" are contributing to the increase. 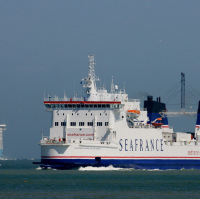 Discover Ferries' figures show 1.14 million cars were carried by ferry operators in the UK and Ireland last month, up from 1.10 million in July 2015. The firm's director Bill Gibbons said: "The signs are strong that 2016 will continue to see an increase in the number of people taking their car on holiday by sea as more people decide to avoid the hassle of airports and embrace the convenience and flexibility of taking their own road trip instead. "We were very pleased to see such a strong performance in July. The firm believes the sunny weather is encouraging more holidaymakers to get out and about in their cars on holidays and day trips. There was a 6.5% year-on-year rise last month in the number of people taking their cars on holiday to islands such as the Isle of Wight, Isle of Man and the western islands of Scotland. Cars taken on ferry trips between the UK and mainland Europe have risen by 2.9%, while ferry routes between the UK and Ireland sees a more modest 1.5% boost. Airlines are warning passengers of expected delays and disruptions to their journeys and advising travellers with instructions for rebooking their cancelled flights due to French air strikes. The summer has seen the cancellation of hundreds of flights to, from and over France, including more than 150 Ryanair flights and more than 50 easyJet flights. easyJet flights were also disrupted by strike action at Amsterdam airport. This is the fourth strike the VNV union has announced. easyJet says it was only given a few hours' notice, making it "impossible" to arrange alternative flying arrangements. To avoid hassle on your holiday, take out trusted travel insurance to protect yourself against delays and cancellations.